This work, carried out in partnership with universities or research centres, helps us to a greater understanding of the needs of these species, so we can better protect them in their natural environment! As safe havens for many species, zoos run breeding programmes, support protection programmes, and much more. They play an important role in the conservation of animals in the wild. Affection creates the desire to protect. Affection comes through knowledge and understanding. Zoo animals are genuine ambassadors for their species. They help us to learn about them, to understand them, to care about them and to protect them. This is why we offer our visitors a number of different ways to get to know the animal kingdom, with programmes for the general public and for school parties. Zoos are places to have fun and relax in the open air and to enjoy being close to nature and animals. Come with family or friends and ride our mini train into the centre of the zoo, where the café is the perfect place for a snack and a drink. There are shady picnic areas available and a number of picnic tables are placed at points along the footpaths. Not forgetting the playground, recently refurbished and right opposite the elephants! To enable them to successfully fulfil these different missions, zoos work together. 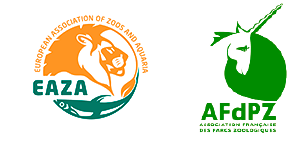 In France they co-operate through AFDPZ, l’Association Française des Parcs Zoologiques, [French Zoos Association] and at European level through EAZA, the European Association of Zoos and Aquaria. Through these organisations, we are able to exchange information on the best ways of caring for the animals and co-operate on research and conservation programmes. These communication and mutual assistance projects are essential to every zoo’s work, and nowadays they could not survive without them! Zoo animals do not come from the wild! They are born in captivity, either here or in other zoos with which we have exchange programmes in place. No financial transaction is involved when these animals are moved from zoo to zoo; we never buy or sell animals! Animals also sometimes come to us after being seized by customs officials. Many species are protected by an international convention (CITES), which regulates and controls their trade and transport. When this convention is breached, the animals held illegally are seized by customs (or other competent authorities) who then hand them over to zoos so they can be cared for.